thAn easy tutorial on how to grill salmon in foil packets. This simple method for cooking salmon requires only a few ingredients, a few minutes, and minimal cleanup. I’m going to give it to you straight: I could subsist – nay, thrive – on grilled salmon alone. There’s something about that smoky-charred flavor with the crispy skin that makes my mouth buds sing each and every time. Truthfully, I’m all about drizzling a little avocado oil over the salmon, sprinkling it with spices, and plunking it right down on the grill. If you’re like me and prefer the fish-to-grill method, you can scope out the way I do it in The Only Grilled Salmon Recipe You’ll Ever Need . While foil-less is my preference, I know there are plenty of you who enjoy cooking your salmon in foil. For those of you who prefer grilled salmon in foil, I have the easiest little tutorial for you. It involves you, some tin foil, your salmon fillet, a lemon, some seasoning, and oil. And salt… don’t forget the salt. 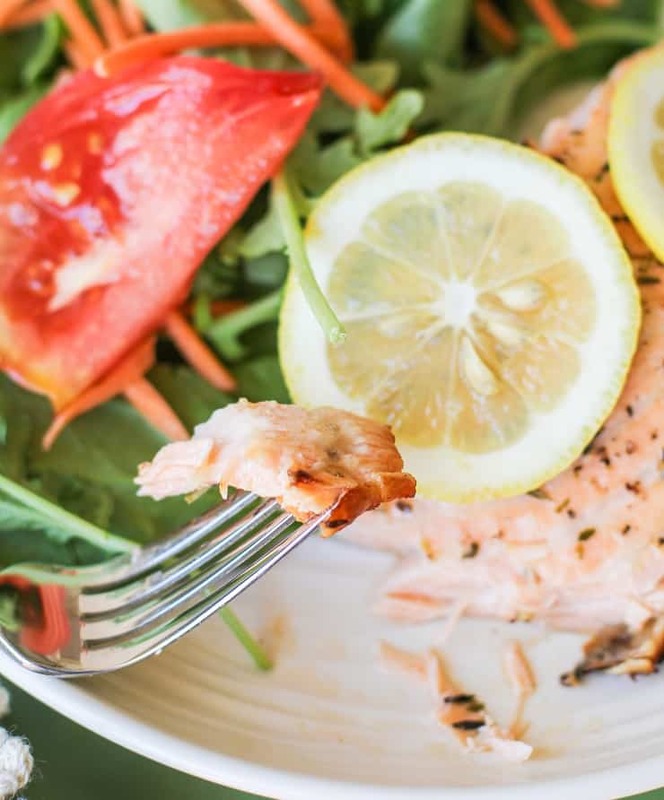 If you’re barbecuing a great deal of other items, grilling salmon in a foil packet can be a useful way to conserve grill space for foods that require higher heat. Simply place the packet on the shelf of the grill or near the high heat foods and cook directly over the burners. This easy recipe can be adapted to your own personal taste by incorporating your favorite spices and herbs, and will be a crowd pleaser at your next BBQ. Fire up your grill! You’ll want to preheat the grill to medium-high (or 400 to 450 degrees F) while you’re prepping the salmon to save yourself some time. Gather your salmon fillets. You can use any size you would like, but I find the smaller fillets are easier to manage when removing from the grill. 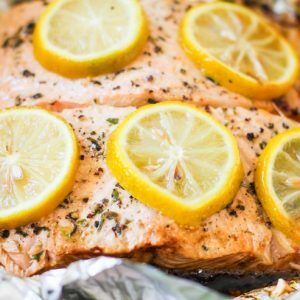 Place them on a long sheet of foil – large enough to fold over the salmon to create an enclosed packet. Drizzle avocado (or olive) oil over the fish, then sprinkle it with sea salt and Italian seasoning (or your favorite seasonings). Lay some lemon slices on top (skip if you aren’t into lemon), then wrap it all up in a cute little package. Place said package on the grill and cover. Cook 10 to 12 minutes (depending on thickness of salmon and your desired level of done-ness. And that’s all you need for your grilled salmon in foil! Serve with your favorite side dishes, and enjoy! I like eating salmon with a big salad, my crowd-pleasing roasted vegetables, or my easy go-to stir fry vegetables. If you want to keep all of the food prep on the grill, you can go for my Grilled Sweet Potatoes, Zucchini, and Yellow Squash with Pesto and Feta. You can also go the pasta salad (try my Pasta Salad with Lemon Poppy Seed Dressing or Kale Pesto Pasta Salad), or potato salad route (check out my German-Style Potato Salad with Caramelized Onions. For dessert? I’m super into Zesty Fruit Salad with Coconut Milk and Basil. Wash it all down with Tropical White Sangria, and you’re in the money! And that’s it! Now you’re set for a complete meal at your next barbecue. An easy tutorial on how to grill salmon in foil. A goof-proof delicious healthy recipe. Preheat your grill to medium-high and brush off any food particles from the last time you grilled using a wire brush. 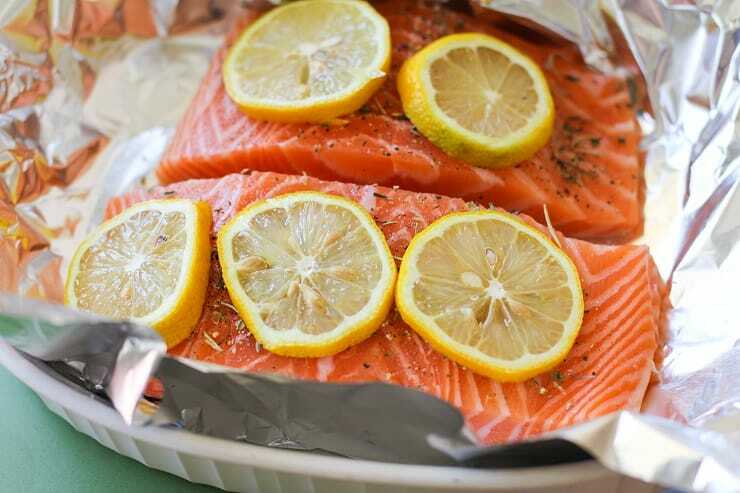 Place the salmon fillets on one large sheet of foil (or multiple sheets of foil for easier grilling). Drizzle with avocado oil and use your hands to coat the flesh of the salmon in oil. Sprinkle with Herbs de Provence (or Italian seasoning), and sea salt. 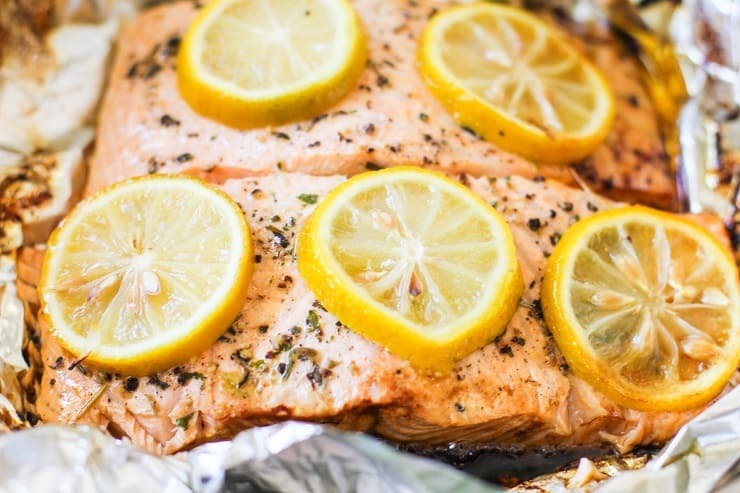 Place lemon slices on top of the salmon fillets and wrap in foil to create a foil packet. 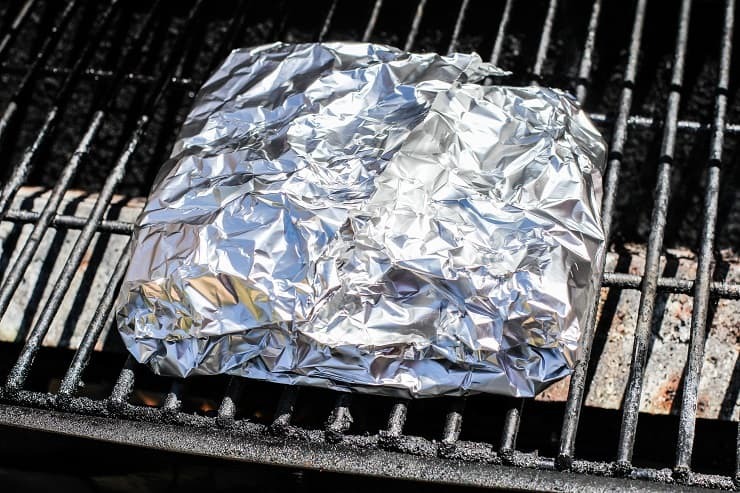 Place foil packet on the grill and cover the grill. Cook for 10 to 15 minutes, or until salmon is cooked through (or reaches desired done-ness). Cook times will vary depending on the thickness of the salmon. Serve salmon with choice of side dishes. 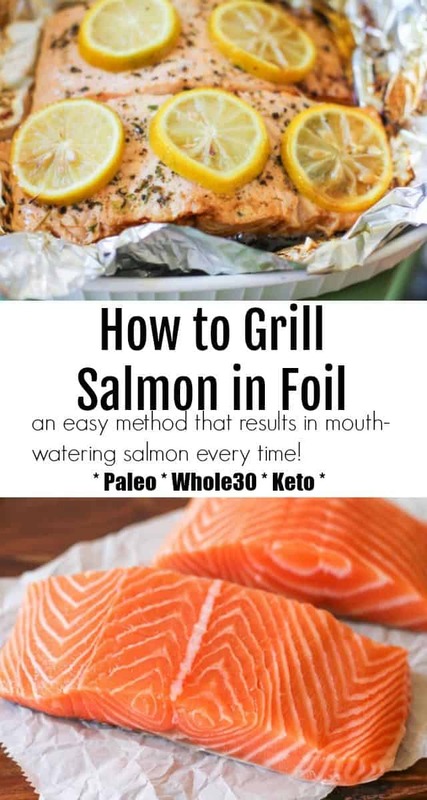 I love grilled salmon too, but have never tried it in foil before! Will definitely have to try…gotta love the super easy clean-up! Sometimes a song will get stuck in your head…..well I have your pictures of salmon stuck in my head and my mouth is watering! Those pictures are wonderful! If you do not want you food to touch the foil, line it with cooking parchment and be sure to include the part that will cover the food. I do this even with baked potatoes. Works really well. Thank you Miss Lindy! This is such a helpful trick! 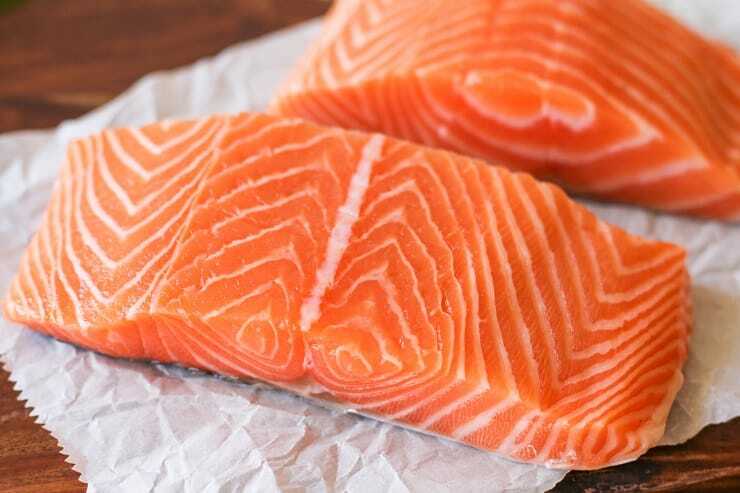 For those of you that want a milder taste of your salmon, try soaking the salmon in brine water for about 30 minutes, don’t bother to rinse, just place the salmon on some paper towels and pat dry. Then prepare as you choose, I too like the foil/grill method. Very tender! As per the recipe, I recommend medium-high heat. If you have a grill that shows actual temperature, that would be 400 to 450 degrees F.